Version 11.5 of the Subscribe2 HTML has been released and is available now. This version has been tested on WordPress 4.9.x and 5.0.x and 5.1. It requires at least WordPress 3.3. Version 11.5 contains the enhancements and bug fixes listed below. Version 11.4 of the Subscribe2 HTML has been released and is available now. This version has been tested on WordPress 4.9.x and 5.0.x. It requires at least WordPress 3.3. Version 11.4 contains the enhancements and bug fixes listed below. For a very long time that has been a check box available in the editor that allows the email notification from Subscribe2 HTML to be suppressed on a per post level. WordPress calls this box a `meta box`. tl:dr; – The Override checkbox needs updating for the new `Gutenberg` editor – where should it go? With the new editor (code named Gutenberg), these meta boxes are supported but conversion to new code is highly recommended (although not well documented!). So, I’ve been looking at how to migrate to new code, particularly because if the current checkbox is ticked and the post then immediately published, the email goes out due to the order in which processes are triggered in WordPress and Subscribe2 HTML (a work around for now is to ensure you save the post before clicking the Publish button). The possible locations for the checkbox are a `Block` or a `Sidebar menu`, and there are drawbacks to both over the current position. And the Plugins section in this menu would be unticked and need clicking to restore the item after being unpinned. I’m sure you’ve all noticed in your WordPress admin areas that WordPress 5.0 has been released. As far as I can tell the current version (11.3) of Subscribe2 HTML works just fine in the new version. You may have also noticed that WordPress 5.0 seems to be one of the most controversial and divisive versions of WordPress in many years, the new Editor seems to be loved or hated with few taking the middle ground. 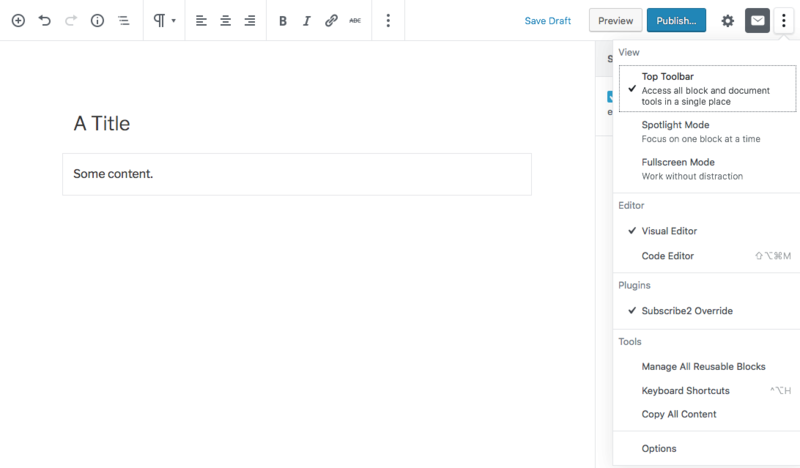 As such a Classic Editor plugin has been made available with WordPress 5.0 to restore the old editor look. Again, Subscribe2 HTML works just fine with this too. Finally, some are very upset with the direction of WordPress 5.0 and they have forked the code and created ClassicPress. While this code is still reported as being in beta testing it seems to be a clone of WordPress 4.9.8. And yes, you’ve already guessed, Subscribe2 HTML works just fine here as well. Version 11.2 of the Subscribe2 HTML has been released and is available now. This version has been tested on WordPress 4.9.x. It requires at least WordPress 3.3. Version 11.2 contains the enhancements and bug fixes listed below. Version 11.1 of the Subscribe2 HTML has been released and is available now. This version has been tested on WordPress 4.9.x. It requires at least WordPress 3.3. Version 11.1 contains the enhancements and bug fixes listed below.